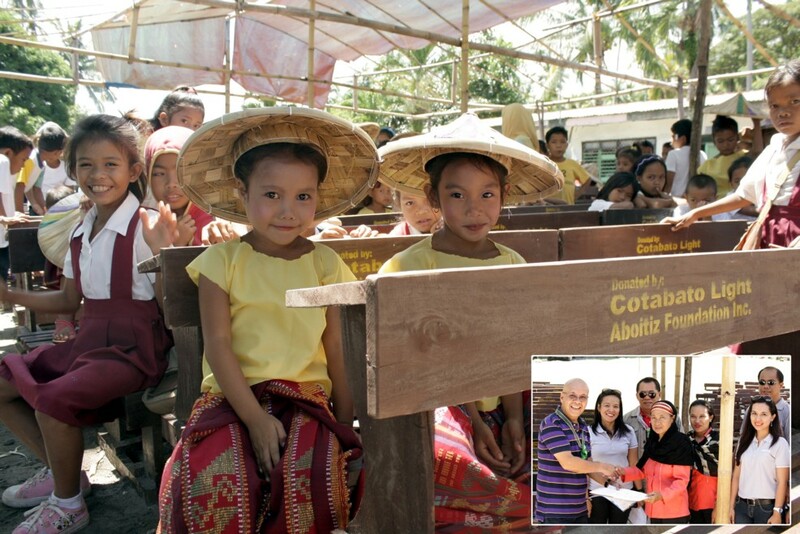 GRATEFULNESS: The smile on their faces says it all – on how grateful the pupils were of their new armchairs and desks donated by Cotabato Light and Aboitiz Foundation Inc. (Photo-inset) VP Cris Ferolino hand-over the Deed of Donations to DepEd District Superintendent Jiajora Datukon. Sitting on the floor - no more as Cotabato Light provided 150 new chairs and desks to the pupils of Kusiong Elementary School. Indeed, it was not a good sight to behold and to endure by the youth of today whom we consider as our next generation and the hope of our nation. Most of the pupils of of Kusiong Elementary School are from hinterlands. They walked many miles just to go to school. Thus, it is an inspiring environment to have a descent school facility that makes learning conducive for students. Seeing such need and opportunity to be of help, Cotabato Light and Aboitiz Foundation Inc. (AFI) are quick to respond to the request of teacher-in-charge Jamillah Andong of Kusiong Elementary School. The school is located at the far-flung rural-area of Cotabato Light franchise with approximately 20kms rough road travel. On September 20, 2011 the Cotabato Light team led by VP and Resident Manager Crisente Ferolino had turned-over to the school - 100 armchairs and 50 desks worth about 98K. The donation was gladly accepted by Jamillah Andong with the presence of DepEd District Superintendent Jiajora Datukon, PTA officers and other school principals. The Cotabato Light and AFI representatives present were Power Gen. Mngr. Jun Ticzon, Comrel Officer Tata Nataño and staff Michelle Prudente, Branding Officer Donjie Vertuoso, PP & Project officer Engr. Anthony Bueno and PP Operation Supervisor John Ruben Bulosan. “Maraming-maraming salamat sa Cotabato Light, sa Aboitiz Foundation, Inc. at sa inyo sir sa inyong tulong sa aming paaralan. The armchairs and desks are really needed by our students. We will take care of these so that many pupils can use it. Sana hindi kayo mapagod sa pagtulong lalo na para sa kapakanan ng mga kabataan.” Teacher Jamillah Andong eagerly said. As the Cotabato Light team leaves the place, the children are joyfully sitting on the chairs and desks - waving and shouting thank you! - A gesture that made our hearts full of gratefulness. Indeed, service to humanity is the best work of life, more so if what we are doing it for the children.